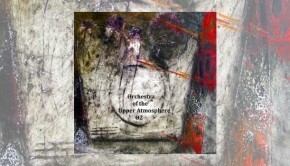 One of the many symbolic meanings of ‘θ’ (theta), the eighth letter of the Greek alphabet, is to signify a special function of several complex variables, and this would seem to apply to the rarefied sonic world of spacious improvisational rock group Orchestra Of The Upper Atmosphere, whose fourth album to be preceded with “θ”, and their fourth excursion into the sonic wastelands of ego-free music making, I am attempting to dissect here. 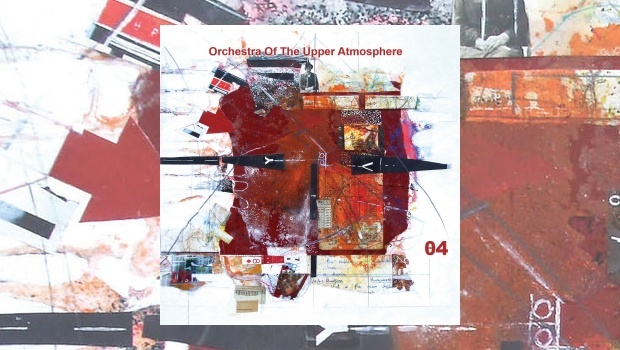 Led by the seemingly workaholic Martin Archer in that hive of alternative culture known to us plebs as “Sheffield”, Orchestra Of The Upper Atmosphere is the closest Martin gets to rock music, among his many other strange, beautiful, occasionally terrifying, and sometimes merely baffling musical outlets. All of this is curated through his long running alternative music label Discus Music. Follow this Bandcamp link for more info. Dense, but in a good way, this music is also entwining and entangling this willing listener, and it takes me a while to find my way through. We are greeted on departure by hints of an altered state Alice Coltrane, and after an infinitely long journey on the mothership that lasts about a minute we later find ourselves lost in the thickets of a blue frond jungle on the seventh planet of an as yet undiscovered star in the belt of Orion, and it is safe to say that θ4 is best navigated through with an open mind. 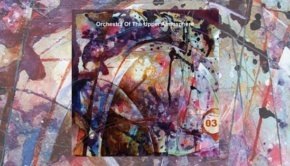 Several surprises present themselves, not least the appearance of solid melodic constructions out of the cosmic melange. Particularly so the jazz ensemble blowing through the loose funk rhythms of Essential Light, a tune that would not appear out of place on a Kamasi Washington album. Terry Todd’s loping and loose bass funk is embellished with Steve Dinsdale’s and/or Walt Shaw’s chattering percussion, skittering around the solid bottom end as would several small critters around a recently replenished garden bird table. This is a pointer that θ4 is more structured than its three predecessors, and unlike those gargantuan blasts of mighty improvisational heft, this is a single CD, so the band have a mere 78 minutes 40 seconds to get their message across. Focus (no, not the band, darn it!) is the key. With their collective eye on the prize, this trip encapsulates fine musicianship with a large sideorder of Kosmische strangeitude, just as it should be. The track immediately after that unexpected jazz excursion, Displacement, neatly sums this up with its low-key free jazz improv piano overlaid with what sounds like someone searching in vain in the percussion drawer for that elusive set of castanets. Odd, but good! Stranger still is The Life And Death Of A Sewing Machine, where a garbled spoken word litany is declaimed atop some free jazz sax blowing. Time-Lapsed follows that last one, and plunges us into a warm bath of mellifluous psychedelia that puts me in mind of The Amorphous Androgynous at their most wonky. One thing is for sure, you could never accuse this band of standing still, or of repeating themselves. The near subsonic bass that suddenly rumbles out of my trusty KEF speakers towards the end of A Widening Road is a blast, but then again I am a sucker for dub treatments. Again percussion driven, this is the sound of the furry animals and the Pict leaving the cave and boogieing on into the heathen night. Marvellous! A glorious almost ska-like beat propels Nanobutterfly for a minute or two before it deconstructs back into a message received from another dimension, and then resurrects the dance. Martin Archer and his merry crew happen across a video of Sun-Ra teaching Jerry Dammers the table manners of the Saturnalian natives over a Bacchanalian feast of unearthly delights. The mesmerising final track, Edge Of The World, is one of a few to feature the voice-as-instrument beguiling affectations of Martin’s “anti choir” Juxtavoices, and the more conventional vocals of frostlake to very good effect. Hypnotic and languorous, this chilled excursion expands into a kaleidoscopic whorl of space jazz in a manner that should leave a smile on the careworn fizzog of our beleaguered planet as we and it hurtles into oblivion. Martin describes this album as containing a few “more commercial tracks”, but there’s nothing wrong with that in the slightest. Give it a go, you may be pleasantly surprised!